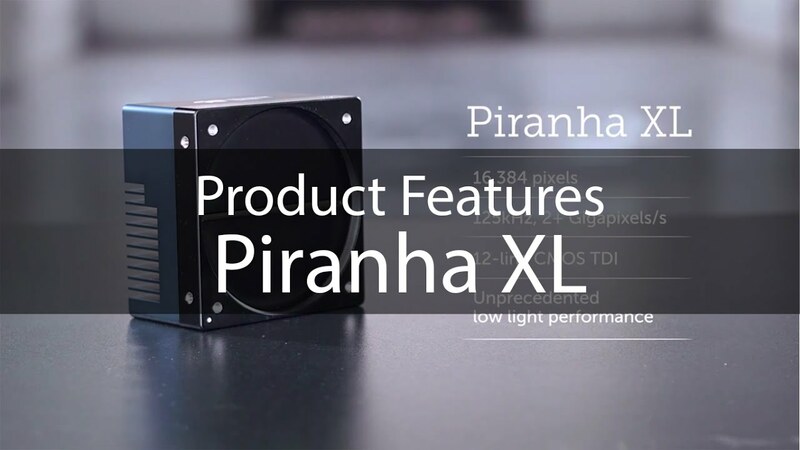 Teledyne DALSA’s CameraLink HS compatible Piranha XL 16k TDI (Time Delay Integration) line scan camera and Xtium CLHS frame grabber combination provide high speed, resolution and sensitivity for demanding inspection applications. This multi-line CMOS TDI monochrome camera features exposure control for each line, and utilises the latest CLHS interface to deliver very high data throughput with long transmission distances and cable flexibility. By enabling the reliable transfer of information at high speeds as well as providing exceptional sensitivity, this powerful combination helps reduce inspection and manufacturing costs, and is particularly well suited to applications where light levels are very low. These include integration into flat panel, electronics, and semiconductor inspection, as well as other machine vision applications. The Teledyne DALSA Piranha XL features advanced CMOS sensor architecture and offers a line rate of 125 kHz. Built in exposure control for each line and the use of TDI technology allows the camera to be adjusted for varying exposure levels resulting in exceptional sensitivity compared to single line cameras, while maintaining low noise. The camera delivers up to 2 GByte/sec data throughput using a single CX4 cable. The Xtium-CLHS PX4 and PX8 are PCIe Gen 2 frame grabbers built for high-speed, high-bandwidth cameras offering up to 7 data lanes to capture aggregate data rates of 2.1 GB/s and sustained host transfer bandwidth of over 3.2 GB/s (using Xtium-CLHS PX8). These high performance frame grabbers feature seamless multi-board synchronization and built-in capability to re-distribute incoming images at maximum camera speeds to as many as 6 additional frame grabbers enabling distributed image processing across multiple computers. Learn all about the Teledyne DALSA Piranha XL, an extremely fast line scan camera: TDI level performance with CMOS value.